There are many reasons for people to get involved in beekeeping. . Harvesting honey from a beehive – their own beehive is one of the major attractions of the hobby. 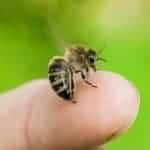 Of course, not everyone keeps bees to produce honey but it is the most popular reason for becoming a beekeeper. How Long Does it Take Before Harvesting Honey from a New Hive Setup? One of the first things that new beekeeper asks me is ..? When can I expect to get a honey harvest? In a few weeks or a few months? Well, yea – it is usually a much longer wait. Beekeepers in many regions will not be able to harvest honey from a new hive until the second year. Taking a honey harvest for yourself too soon can lead to hive failure. Don’t rush the harvest time. 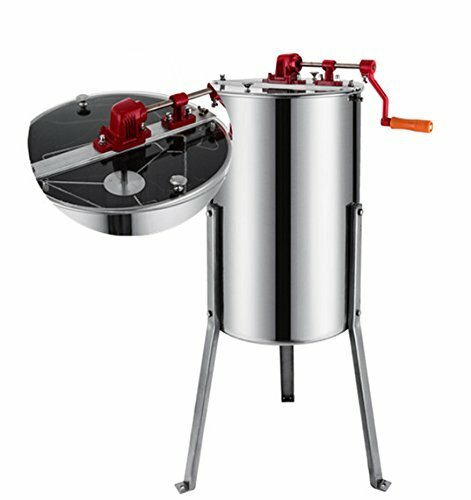 What is the Best Type of Hive for Honey Production? There are several different types of honey bee hives in use in the United States. The top 3 hive designs are: top bar, warre and Langstroth. Technically you could harvest honey from any of these hive types. 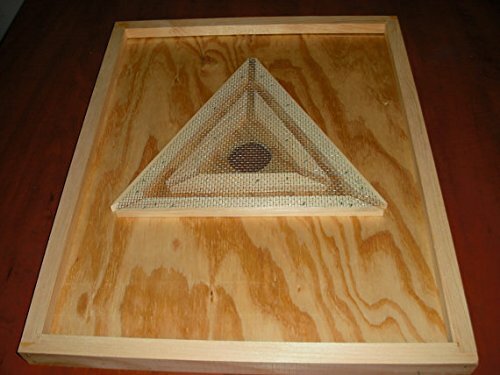 The most common type of hive for honey production is the Langstroth hive design. This is the starter hive that many people use in the beginning. You will of course add more boxes to hold the honey harvest for you. Other hives types can produce honey of course. But, most beekeepers that want to produce honey use this type of hive. There is nothing wrong with being excited about getting your own honey made by YOUR bees. If fact, your first honey harvest from your bees will likely be the best honey you have ever tasted. Maybe even the best honey in the world? (Ok, I’m getting a little carried away here.) However, before you run down to the area general store and load up on glass jars, you have a few things to consider. Harvesting honey does not hurt the honey bee colony. This is true as long as you practice good beekeeping and do not take too much. Greedy beekeepers often end up with starving bees. That is just not right – in my opinion. No harm is done to the bees with responsible honey collecting. #1: How Much Honey Will a Beehive Produce ? How much honey your bees produce varies from year to year. Over time you learn what the average honey production is for your area. Your location factors into all aspects of honey production and harvesting. This is because different climates have different blooming plants. The length of Winter cold (and amount of honey your bees need to keep) will also vary. In my area of South Carolina, I know that we do not have a good Fall honey flow. I take the surplus honey (made in the Spring) in June or July. I don’t expect to make more for the year. Many locations have a good Fall honey flow and will make excess honey production for themselves and the bees. You must learn to understand local conditions and how they affect you. When you are harvesting honey from a beehive, don’t be greedy. Your bees need good nutrition that only honey can provide. Harvesting excess honey does not harm the bees. But only take the surplus honey of stored honey. #2 : How do I Know When to Harvest Honey? Honey bees make honey from plant nectar. Female worker bees gather the watery sweet nectar and return to the hive. House worker bees accept the nectar and begin the honey making process. Enzymes from the bees’ mouth are added to the nectar and the water content is reduced. This process results in a low water content product that is suitable for long term storage. When honey is ripe, it is placed in beeswax cells and covered with a wax capping. We call this “capped honey” – cool right ? In general, bees will not cap honey until it is ripe. Until the honey is ripe, it will not store well. Unripe honey will spoil or ferment. The most common acceptable moisture content for honey is 18.6% or less. 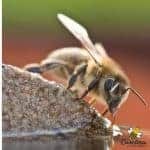 It is pretty impressive to consider that bees collect nectar with a water content of around 80% and transform it into honey with a water content of 18.6% or less. Before harvesting honey from a beehive. The honey cells should be mostly capped with wax. How Can I Know for Sure if Honey is Ripe? Can my honey be uncapped and still ripe and ready to take? Yes. I have had some years when the nectar source was abruptly cut short by weather conditions. My poor bees had finished the honey making process but they were struggling to cap it. I was able to remove the excess honey and save them the trouble. How did I know ? 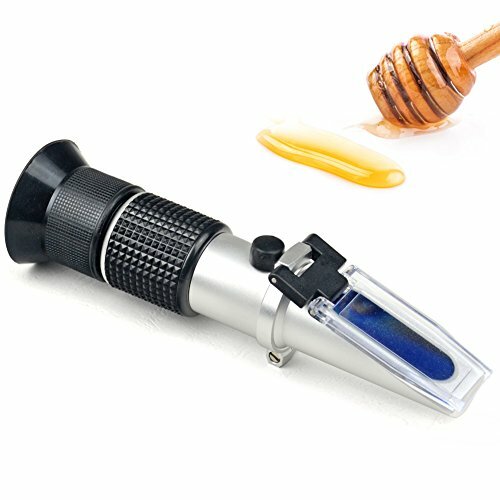 I had an item known as a honey refractometer. A refractometer can measure the water content of honey. By taking it to the bee yard and testing some of the uncapped honey, I was able to determine that it was okay to harvest. But in general, listen to your bees and only harvest capped honey. Ripe honey ready to harvest from a beehive will usually be capped. #3: Do I Harm My Bees by Taking Honey? This is a touchy subject that gets into all kinds of ideas and points of view. I will share mine and respect yours. Personally, I do not like the term “robbing bees”. I always leave the amount of honey on my hives that should get them through an average winter. Sometimes, I am wrong and have to feed in the Fall. I never take all the honey and force my bees to survive on honey made from sugar water. So, I do not feel that I am robbing my bees – it’s more like collecting rent for the hundreds of dollars I have spent throughout the season. 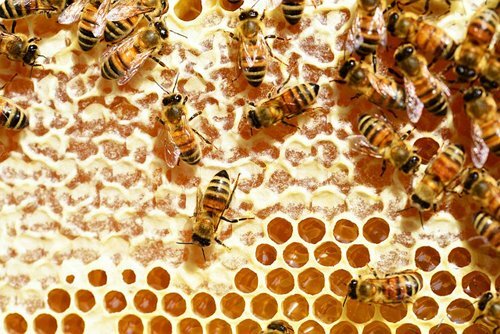 As a beekeeper, you will have to decide how you want to manage your colonies. Create a beekeeping philosophy that you can live with. #4: How Do I Get the Honey Away from the Beehive? Honey is heavy ! Use a truck or have a cart nearby. Have a plan for getting it back to an inside bee tight room. The honey bees will probably not be too happy about giving it up either. If you are harvesting honey from a beehive late in the season, your colonies may be large and powerful. I do not use smoke to harvest honey. (Though I do keep one on hand.) Take care to avoid spilling honey in the beeyard. This could start robbing and result in colony losses. The idea is that the bees will leave the top honey supers at night and go down to the brood area. The bee escape is a one way tunnel so the bees can not get back into the honey supers. This requires lifting the heavy honey boxes twice – Once to place the escape board and once to harvest. This method does not work well in the South where its hot at night. Just Bees Blowing In The Wind: Some ingenious beekeepers developed the idea of using a blower to harvest honey from a beehive. Assuming you use a queen excluder to keep the queen out of the honey supers, bees are blow out of the honey box. 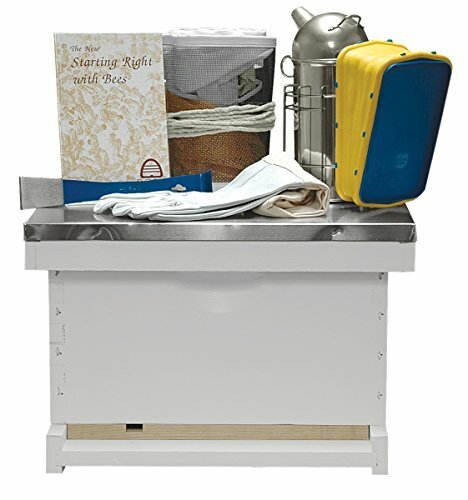 A honey box is set on its end on the tailgate of a truck or something similar. A leaf blower or bee blower is used to blow the bees back towards the hive. Fume Boards Are My Choice: My favorite method of harvesting honey from a beehive is the use of a fume board. I have been using fume boards to harvest honey from the beehives for several years. I highly recommend it to those of you with a few hives – or a few hundred. 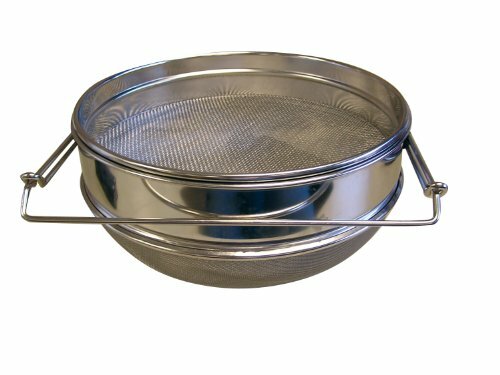 A small box with a metal top and an inner surface of absorbent material is used. It is the same size length and width as a honey super. A special product is lightly sprayed on the absorbent material inside the fume board. I do not use or recommend any of the stinky liquid products. I use Honey B Gone or Bee Quick. After spritzing the inside of the fume board. Place it on the honey super that you want to remove. The bees do not like the scent and should leave the honey super within 10 minutes. No harm – no foul. Your first honey harvest can be intimidating but a fume board is a big help. #5: I Have Harvested Several Boxes of Honey – Now What ? Don’t stand there ! The bees will take that honey back ! 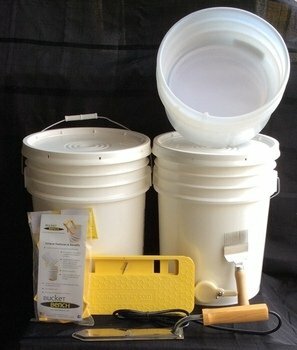 Have some extra equipment (beehive tops), canvas clothes, etc to cover each honey super as you remove it from the hive. 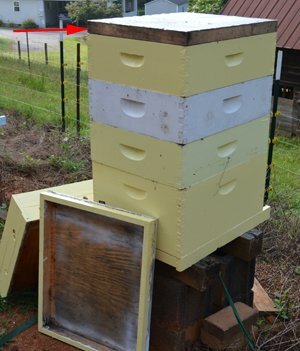 As soon as you finish in the bee yard, get those honey supers inside a bee tight room. Extract your honey within 2 days if you live in an area that has Small Hive Beetles as a pest. Beetles can ruin boxes of honey left patrolled by bees. Can I Keep Bees Without Harvesting Honey? Yes, of course. Many people keep bees and never harvest or collect honey. They want the hives for pollination or just because they enjoy watching them. If you do not collect honey, your hive will swarm when it gets crowded – but that’s okay. You can simply enjoy being a part of the honey bee world. Some homeowners keep bees with no thoughts of producing honey. Honey bees live in large colonies that excel in pollination. Having bees on your property increases the average yield of your vegetable gardens & orchards – including those of your neighbors! 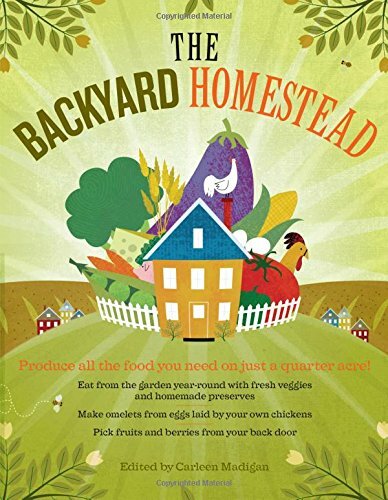 Bees are a welcome part of any homestead. This applies to a 40 acre farm or a 1/4 acre backyard. Now, aren’t you proud of yourself. In my area, beekeepers don’t expect to harvest honey for themselves the first year. In good years, they may get a small amount of surplus honey from new colonies. But, don’t rob your bees by taking everything and leave them to starve in the winter. That is poor beekeeping. Congratulations on harvesting honey from a beehive – now enjoy. With proper storage, your honey will last forever. It helps to have the proper tools to remove and bottle your honey. Both of my hives have five or more frames of capped honey. And I have no idea how much they will need to survive the winter. So I have left them alone and next year I will be taking some for the rent. LoL But I would love to harvest some this year. I understand completely. Been there ! It’s late August and I know that my bees need a full shallow super before the end of October. You probably need to be feeding them now. For sure, if they have not drawn out all the comb. I know its hard to wait but the honey will taste even better next year. Thank you so much for your blog. I’m a second year beekeeper and have learned so much from you in the past year. I live in East Tennessee outside of Knoxville. I have harvested 12 frames of honey and some of it has been reclaimed while I was trying to figure out how to get them off the honey and closed up. I’ve been waiting on an extractor from my club to extract the honey. It’s been two days now and I am worried about my honey. It’s closedup but not air tight. What should I do? Thank you. Yea, I would be worried as well if you have Small Hive Beetles in your area. You may have to consider freezing it and then letting it thaw before extraction. You are certainly welcome. Be sure to read my posts on storing honey, bottling honey and storing equipment. I also have a How to Harvest Class.